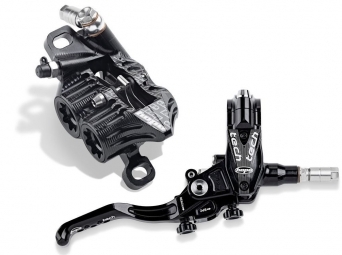 The brake Tech V4 is undoubtedly the king of the brakes at Hope. This brake is a perfect blend of power, progressive, light and reliable. PM caliper, with adapters for all standard forks. for driving the second pads. Post mount bracket 9.74, with adapters for all standard forks. Disk available: 183 and 203 mm 3 and 6 holes. HOPE 2013 Tech EVO V4 Stealth Frein arrière durite aviation Sans disque Noir clasificado 5.0 de 5 por 1. Rated 5 de 5 por Anónimo de Commentaire sur ce produit super matos certes un peu cher mais je les ai testé sous la pluie sur une piste noir et c'est un régal, dosable à souhait, la puissance est au rendez vous, la finition est parfaite, que du bonheur, je recommande vivement, c'est un tres bon investissement.